Mangia! Mangia! – Gelato and Hot Chocolate Together! Does anyone else experience this seasonal change – a summer yen for gelato, but a winter chocolate craving? In Florence there is a small shop to visit all year long – Vestri Cioccolata (e Gelato). 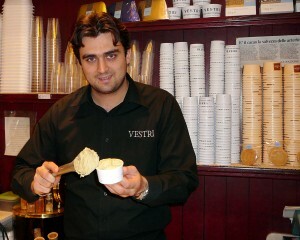 Leonardo Vestri has solved that problem of bridging the seasons with Affogato (Gelato “Drowned” in Hot Chocolate). In the mid-1960s, Leonardo’s father Daniele, followed his own father into the artisanal chocolate world in the southern Tuscan town of Arezzo. Recently, Daniele went to the source to assure that he had the finest cocoa. He purchased a “finca”, a cocoa plantation in Puntacana, Dominican Republic. The dried beans are shipped to Arezzo for the final phases of toasting, refining and tempering. 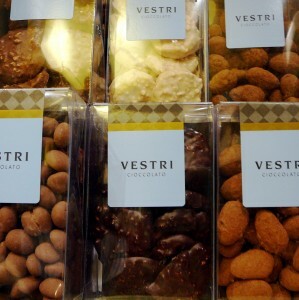 Vestri is gaining a worldwide following for specialty chocolates – dark chocolate with hot peppers, Grand Duke Cosimo de’Medici’s favorite chocolate, dark Caraibico with roasted chocolate nibs, dark, white and milk chocolate-covered hazelnuts and almonds, and chocolate-covered candied orange slices and peel. Stefania, Daniele’s wife, designs the eye-catching decorative chocolates, as well as the smart boxes, trendy logo and luscious web site. Leonardo’s passion is gelato. In 2002, he took off for Florence where he opened a Vestri family chocolate shop, but then installed a small gelato bar where sixteen special flavors are offered each day. Leonardo starts his morning at seven making each flavor from scratch, using fresh milk, cream, eggs, fruit, Vestri chocolate, liquors and spices. Fruit flavors are only offered when the fruit is in season – for October through December, Leonardo offers fresh fig, persimmon and chestnut gelato. His traditional Tuscan Buontalenti gelato includes fresh milk, mascarpone, sugar, egg, liquor (“secret”), a hint of fresh lemon peel, and a couple of secret spices. This gelato, named after Bernardo Buontalenti, a sixteenth-century Florentine architect, who may have been one of the world’s original ice-cream makers, is a local specialty. Now that Florence has a gelato shop on every corner and more opening every week (thank you, Mr. Berlusconi, for relaxing the retailing laws), it is even more important to know what goes into making the gelato you buy (especially since even the smallest cone goes for $2.40). Just because the sign at the front door says “produzione propria”, “gelato artigianale” or (for the tourists) “home made”, that does not mean that the gelato served is made with anything but powder, water and artificial colors and flavor, or even that it is made on the premises – one central gelateria boasts the sign and then proudly tells its clients that the gelato is made in Novoli, a suburb of Florence. Aficionados of Vestri’s gelato rave about the pistachio (“Wow!“), chocolate with pistachio (“a knockout!“), dark chocolate (“sublime!“) and “a total winner!“), the dark chocolate with hot chili (“gelato that bites back!“), and the white chocolate with wild strawberries (“ridiculously creamy!” and “pure and delicious!“) Vestri, as could be expected, specializes in chocolate gelato – classico or with an extra hint of flavor – cinnamon, chili, pistachio, mint, orange, lavender, sage, basil, Earl Grey tea, and coffee. All year long Leonardo is offering liquid chocolate in plastic shot glasses (small or large). In the summer it is served cold. In the winter it is heaven – hot, thick and rich. The cioccolata calda comes in two strengths – San Dominigo Cru (65%) and Venezuela Cru (75%). You can drink it straight or with cinnamon, ginger, nutmeg, bitter orange or hot chili mixed in. But when the gelato and hot chocolate craving hit at the same time, the Affogato is the way to go. First Leonardo pours in the hot chocolate (at your desired strength) and then scoops in the gelato of your choice. The most decadent choice must be 75% Venezuela Cru with Stracciatella (chocolate chip) gelato – first there is the hot chocolate hit followed by a spoon of creamy vanilla with chocolate bits. And at the end a bite or two of dark hot chocolate with Vestri artisanal dark chocolate chips makes you love that the seasons change. Okay, I am emailing you a list of things to bring from Florence to New Mexico when you come for a visit!! I bought myself a quart of organic milk and a box of organic Allegro drinking chocolate to celebrate the cold weather – already had a cup of hot chocolate. Maybe another today! Thank you for pointing out that some Italian gelato is junk! 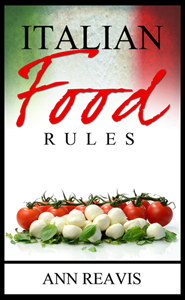 It is important to seek out the real artisanal gelato – to support the people making real food from real ingredients. Voglio morire in un affogato di Leonardo Vestri! Il gelato di Vestri è una mia incontrollata passione, ci passo spesso e non sò resistere. Interessante davvero conoscere la storia della Famiglia Vestri. 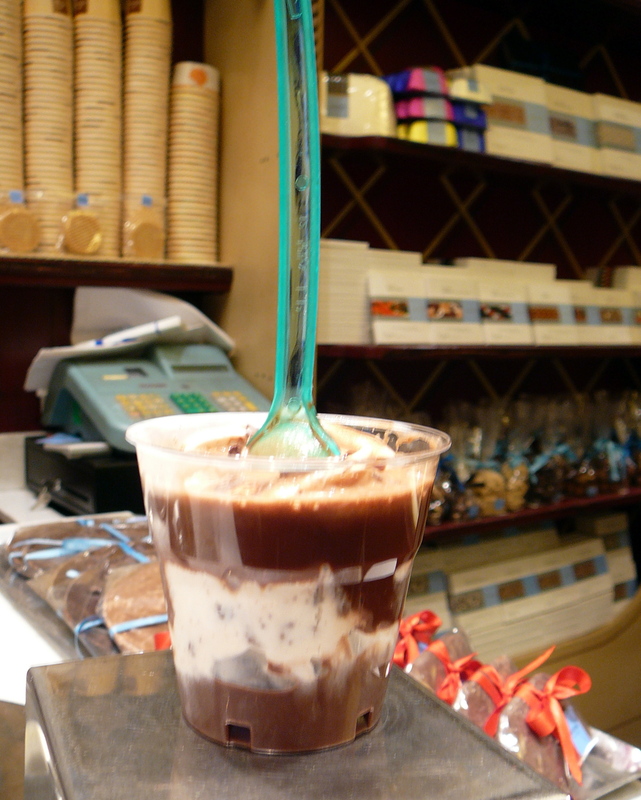 I fell in love with the Vestri hot chocolate when I visited Florence in November of 2005. I’ve never had anything like it in the US. Do you know if it is possible to buy a “mix” of it from Vestri – over the internet? Not to be missed if you are in Italy. It is reason enough to return!